Ok, so you're wondering what the hell we are doing here. Well, sometimes we just get ideas or figure stuff out, or people just ask us, and we've got to share the knowledge. So, without getting into some long winded dissertation about why, lets just start a helpful list of tutorials. Quick sample links are provided for your convenience. Video - tutorials generally applied to video related projects. 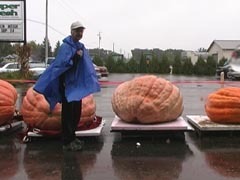 Support our documentary, buy Giant Pumpkin Seeds. 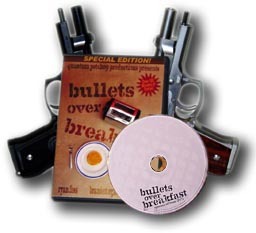 Check out these tutorials in action in our short film Bullets over Breakfast. We're looking for talented people in the Mpls/St. Paul area and beyond. 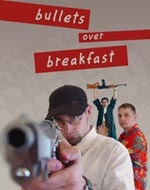 Support Independent Filmmakers, Check out Quantum Petshop's Bullets over Breakfast Special Edition DVD. Packed with 120 minutes of entertainment, including detailed tutorials. Got that video project that's screaming for bigger, better gun blasts. Here's a way to easily add that muzzle flare and flash you so desperately need. Use Adobe Premier to create a simple smoky overlay. Applicable to text (for credits maybe), or even logos or whatever else you may have in mind. May be applicable to other NLEs. A Render Cloud tutorial by Ryan Foss. Use Adobe Premier to create a sci-fi teleportation effect. Teleport you, your friends, or anything with ease. Should be applicable to most NLEs. Don't let the cheese of the sample fool you, with a little extra work and some decent images (or complimentary video), you can achieve a cool looking teleportation. Fancy transitions have potential to be lame, but there may be good reason to use this one and this one is fun. Very similar to the Electric Rings and Arcs tutorial below, but this one is specific for video. A Render Cloud tutorial by Ryan Foss. Image - tutorials specific for image creation or manipulation. Our collection of text and font style turorials for Adobe Photoshop. Effects such as fire, bubble gum, light rays, chrome, wind, ice, frost, radiation, gels and slime and more! Use NASA Satellite imagery to create true color satellite images. A quick way to make a simple painted logo like ours. Bill explains how he colors his line drawings with Photoshop using Layer Modes, Layer Masks and Layer Sets. Ryan explains some of the basics behind his "Render Cloud" tutorials by first exploring Adobe Photoshop's Cloud and Difference Cloud filters. This is the starter tutorial, explaining and outlining methods that his other tutorials build upon. So you have a seamless image, but when you apply some filters, the seamless-ness is destroyed. Here's an easy way to maintain your seamless integrity. 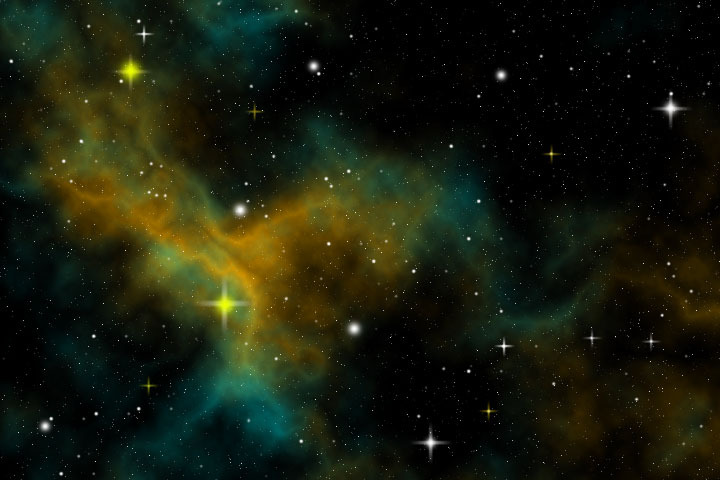 Create your very own space opera backgrounds. Learn simple and easy methods to create cloudy, nebulae rich starfields. A Render Cloud tutorial by Ryan Foss. Make your own camouflage. A Render Cloud tutorial by Ryan Foss. This is just a cool way to make a neat image. A Render Cloud tutorial by Ryan Foss. Some kind of cheesy quick electric ring effect. A Render Cloud tutorial by Ryan Foss. Some kind of cheesy quick smoke. A Render Cloud tutorial by Ryan Foss. Hardware - tutorials for the independent filmmaker specifically. On the cheap, here are instructions for building your own mini-DV camera shoulder brace/camera gun with easily found materials at your local hardware store. How to build your own dimmer box for light control. How to build your own steady cam contraption. Other - we dabble, and this is some of the splatter. Instructions for people who want to grow 500lbs pumpkins with a little work. 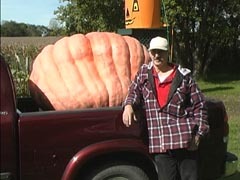 So you want to Grow World Class Giant Pumpkins? Detailed instructions for people who want to grow 500lbs (and bigger) pumpkins. Description TBD. Tutorial is not finished.